The Church redesigned, restored and renewed its new home in central Copenhagen. At 40,000 square feet, this Neoclassical building was originally constructed in 1796. Prominent in the extreme, the facility stands just steps from the Strøget, where 75,000 pedestrians pass by every day. RECEPTIONOpen seven days a week, morning to night, the Church of Scientology of Denmark Reception welcomes anyone wishing to obtain an introduction to Dianetics and Scientology. 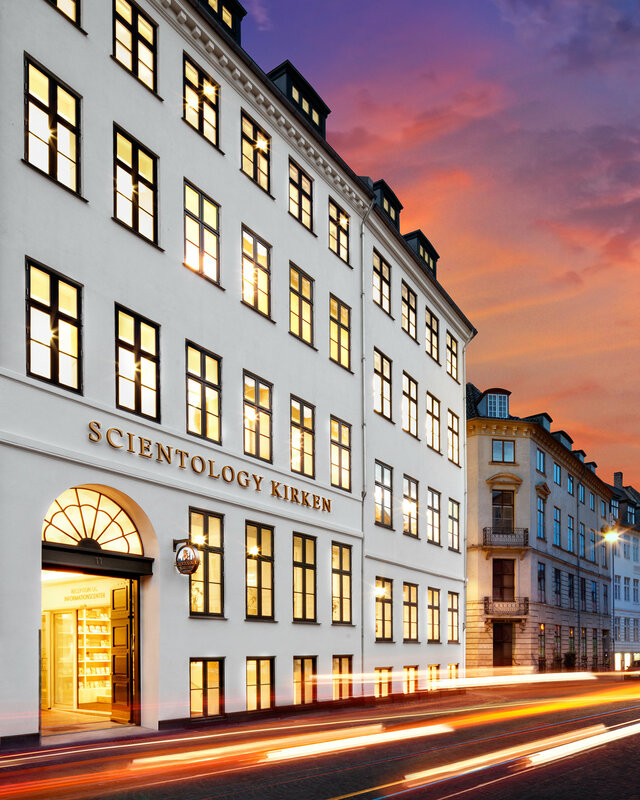 INTRODUCTORY SERVICESThe Church of Scientology Denmark provides for the delivery of all Introductory Services. These include an entire array of Scientology Life Improvement Courses to help better any aspect of one’s life. Among the many services available are evening and weekend Dianetics and Scientology seminars and the Success through Communication Course, which teaches the underlying skill to succeed in both professional and personal relationships. DIANETICS & SCIENTOLOGY BOOKSTOREThe Church of Scientology Denmark Bookstore makes available L. Ron Hubbard’s works on Dianetics and Scientology. In all, Mr. Hubbard’s legacy comprises tens of millions of published words in dozens of books and thousands of recorded lectures. A Materials Guide Chart provides an informational overview of every book and lecture series and the subjects contained within each. Materials are available in 50 languages. THE PURIFICATION CENTERScientology Founder L. Ron Hubbard developed the Purification Program to free individuals from the mental and spiritual damage caused by drugs and toxins, through a regimen of exercise, sauna and nutrition—all of which are provided for in the Purification Center. The mural pays homage to Denmark’s intrepid spirit and symbolizes a new dawn for Copenhagen. HUBBARD GUIDANCE CENTERThe Hubbard Guidance Center is where Scientologists receive one-on-one spiritual counseling, known as auditing. Just beyond the waiting room are dozens of auditing rooms. THE ACADEMYThe Academy is where Scientologists train to become auditors (spiritual counselors), capable of applying the technology of auditing to help others attain spiritual freedom. The Denmark Academy comprises multiple course rooms, each devoted to a different aspect of training. The Café welcomes visitors touring the Church and provides a gathering place for those attending the many scheduled events. It is further provided for parishioners during breaks in their Scientology services. THE CHAPELThe Chapel, lined with the Codes and Creed of the Church of Scientology, provides for all congregational ceremonies and services—including Sunday Services, Weddings and Naming Ceremonies. The Chapel also serves as an ideal venue for workshops, banquets and events, in the name of community collaboration for the betterment of Denmark. THE OFFICE OF L. RON HUBBARDAs is tradition in all Churches of Scientology, the Office of L. Ron Hubbard stands in honor of the religion’s Founder and symbolizes that this Church is true to his writings and ideals. Since 1968, we have served a growing congregation in Copenhagen. Today, from our landmark home on Nytorv, we are honored to extend our help to communities across Denmark. To that end, we share our Church and our many social betterment and humanitarian programs with this nation. We look forward to working with every group and individual dedicated to uplifting society in the same spirit Copenhagen became Denmark’s thriving and peaceful cultural center. Together, we can achieve our common dream of a drug-free, crime‑free and flourishing future for all. 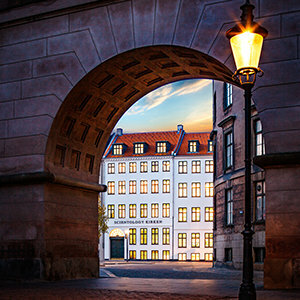 The landmark Neoclassical townhouse at Nytorv 11-13, today home to the Church of Scientology, was originally constructed in 1796 by merchant and brewer Jens Lauritzen. One year earlier, fire had consumed the Nytorv/Gammeltorv district, and city planning mandated the building’s distinctive “broken corner” façade to allow long-ladder fire engines to navigate the city’s narrow streets. Stroll down the longest and busiest walking street in Europe and you arrive at the very birthplace of Copenhagen. A site where two historic squares converge—Nytorv (New Square) and Gammeltorv (Old Square)—the original meeting and marketplace for Danes when just a mercantile community nearly 1,200 years ago. Since then it has been the sight of great disasters, divine art and everyday Danish life. Today, it is where the past engages the present, as this is the gathering place for all Copenhageners. 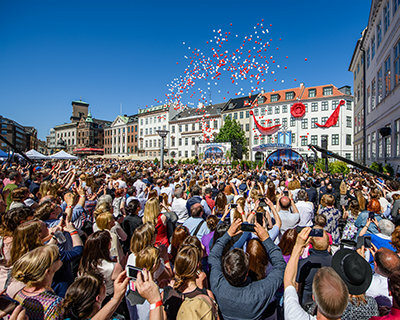 So it was, on a glorious Danish afternoon, more than 2,500 Scientologists and guests assembled on the cobblestone square to celebrate a new page in the history of one of Scandinavia’s oldest and richest cultural capitals and the next step in the Church’s season of expansion.